As Nigerians grapple with recession, the Nigerian National Petroleum Corporation, NNPC, Monday reminded the nation that the sale of petrol at N145 per litre was no longer feasible with the current price of foreign exchange. He said: “We have a very difficult business environment. It is impossible today to import products at the current market price, at current fixed foreign exchange, FOREX rate. Kyari, who explained that the current price was not realistic, however, said that any official increase by the government would not go down well with the citizenry as it will be resisted. 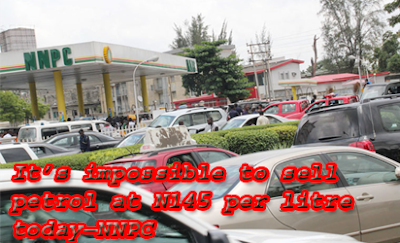 “I also know today that it is impossible for this government to announce tomorrow that petrol is about N150. This government cannot sustain it. That is the truth. The people will not accept that figure. ‘’That is why suppliers are not importing. It is not FX. We have created a niche market for the FX. I am part of the committee allocating FX. We gave FX. It was rejected. The reason being given is that FX is not enough to import. But that is not true. “The truth is that marketers go back to the market and land it here, that you are required to sell it at N145 maximum. I am sure they won’t make it. We won’t let you do it today. That is the main reason people are not importing today. It is not FX,” he added. Kyari further expplained that Nigeria was still in a subsidy regime, as the NNPC took the bulk of importation to ensure that petrol was sold at the official rate of N145 per litre. “Today, we are in subsidy regime, absolutely. There is no way you bring product today and sell at N145 and get back your money, and make profit. That is not possible. You can see some marketers saying that fuel is N138. ‘’It is because they did not import. Somebody has taken the heat off the price. Because we (NNPC) have taken the heat, and you buy from us; you can afford to go to the market and then put a ridiculous price. It is not possible, because they did not import it. It is not FX,” he said. Debunking the notion that marketers were constrained by the unavailability of FX, he accused them of being reluctant to go for it.